Are We in the Process of Creating a New and Enduring American Underclass? The question is whether these trends will become “the new normal,” consigning millions to an emerging American underclass. Is our notably cruel brand of capitalism ultimately leading to something that looks more like feudalism – with low-paid serfs feeling fortunate just to have an opportunity to toil for their lords' enrichment? Consider a bleak snapshot of our ailing economy: Real corporate profits are now near an all-time high, yet one out of six working people are either out of a job or have no choice but to work part-time. We just saw a huge two-year gain in productivity – the amount of goods and services produced per worker. In 2009, it rose by 3.5 percent, and last year we saw a 3.6 percent increase, the largest in eight years. At the same time, labor costs – the value of wages and benefits – have seen their steepest decline since 1962-'63. This is the result of companies putting the big squeeze on their workers – threatening to cast them into a sea of unemployed Americans if they don't produce more for the same wages. These numbers tell us that an economy that now employs seven million fewer workers than it did in 2008 can produce the same amount of stuff, albeit at a great social cost. According to an analysis of Census data by USA Today, just 45 percent of the population now holds a job, the lowest share since 1983. Over the past decade, the number of non-working adults in the US has increased by 27 million. Those who have been laid off and were then lucky enough to get rehired aren't faring well. In an employers' market, over half of all full-time workers laid off after at least three years at the same job return to the workforce with lower wages. According to the Wall Street Journal, more than a third of them lose 20 percent or more of their previous income. The average length of joblessness among the unemployed is now 39 weeks, shattering the record set during the 1981 recession by around 17 weeks. The long-term unemployed face unique barriers to reentering the labor force – many have bad credit and anecdotal evidence suggests that employers tend to discriminate against them for the crime of being unemployed for an extended period. There are about five jobless workers for every full-time opening, but when you include involuntary part-timers, that ratio rises to 8:1. The impact of that kind of extended unemployment can reverberate for decades, long after the economy has recovered. Columbia University labor economist Till von Wachter studied the fortunes of workers who faced sudden lay-offs during the 1981-1982 recession in the period since that time. He found that even after 20 years, those workers' wages were still 20 percent lower than comparable workers who had held onto their jobs in the early 1980s downturn. Research shows that children of workers who lose jobs and go back to work at lower wages appear to suffer from lower wages, too. In a 2008 study, a group of economists tracked the wages of 60,000 father-child pairs from 1978 to 1999. Children whose fathers went through mass layoffs in the 1982 recession ended up with 9% lower earnings than similar children whose fathers didn't experience the job cuts. But it's not just the overall number of jobs that tell the tale. Lost in the celebrations over last month's modestly improved unemployment report was any discussion of what kind of jobs are being created. According to research conducted by the National Employment Law Project (NELP), the recovery “has been disproportionately driven by industries that pay median wages below $15.00 an hour.” Three out of four jobs the economy added last year were in the bottom 40 percent of the wage scale, while only one in 20 were in the top 40 percent. The squeeze is widespread. A survey of American businesses conducted by the Society for Human Resource Management found that over the last six months of 2010, almost four in 10 companies laid off workers, froze wages and suspended bonuses. Twenty percent reduced employee benefits and six in 10 said they hadn't rehired any laid-off workers. Only 11 percent had “restructured executive compensation” – those in the executive suite appear to be doing OK.
What Is Corporate America Doing With All Its Loot? US firms are now sitting on $1.9 trillion. What are businesses doing with all that cash sloshing around? First, they're investing more overseas – in the first half of 2006, the last year before the crash, American multinationals invested $30 billion more abroad than foreign companies invested here. In the first half of last year, that number was up to $220 billion. Companies are investing abroad because that's where the customers are. 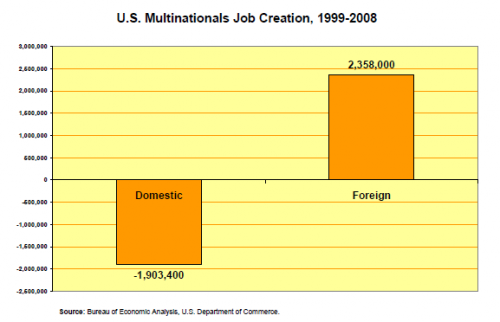 That continues a longer trend – between 1999 and 2008, US-based multinationals cut 1.9 million net jobs in this country while creating almost 2.4 million overseas. Annie Lowery, writing for Slate, notes that companies are also pursuing a variety of strategies that “make investors wealthier.” They've increased dividend payments to investors, bought up smaller companies and bought back stock. Those are the big boys. But with demand in a trough, the “Main Street” economy has seen a steep decline in entrepreneurship – people aren't starting new businesses. According to the New York Times, “In 2009, 115,795 fewer employer businesses were founded than in 2007, a 17.3 percent decline in firm formation.” New layoffs have slowed dramatically since the peak of the recession, but the unemployment rate remains stubbornly high because there aren't enough new jobs being created. Meanwhile, the mortgage crisis rages on unabated. Home prices are still in decline, which will further squeeze consumer demand – which accounts for around 70 percent of our economic activity – through what's known as the “wealth effect”– the more accumulated wealth people own, the more they spend. For every dollar lost in US housing wealth, economists estimate that the economy will lose between 5 and 7 cents in consumer demand. It's important to understand that this bleak economic picture is an extension of our broken politics. Washington could have approached these problems with the seriousness they merit. They could have passed a much larger stimulus package, as many economists argued was necessary. They could have ameliorated the foreclosure crisis by allowing judges to reduce the outstanding principle on “underwater” mortgages. They could have directly created jobs like we did during the Great Depression. But all of that was, and is, off the table. While Obama's deficit address this week drew praise for its political acumen, he conceded the debate over cutting public spending at a time when private consumer spending remains in a trough. The discussion will now focus on what will be cut, and by how much. And what we're really talking about in this age of austerity is cutting “transfer payments” that put spending money in the pockets of the unemployed, the poor and the elderly, and sending more government workers to the unemployment lines. Those newly jobless people will, in turn, cut down on their spending and some will be unable to make their mortgages, adding to the foreclosure crisis nobody's talking about anymore. Both trends will further depress demand. More troubling is the fact that nobody knows what the next “engine of job growth” might be. The big winners in this economic recovery appear to be large financial institutions that have less competition after several large players went under during the crash, and that's not the kind of broad growth that will help the job market. These trends raise the frightening prospect that we're in the process of creating a permanent underclass in the United States. At the very least, history tells us that the big squeeze corporations are now putting on American workers will have enduring effects on our economic wellbeing for many years to come.